As I mentioned in an earlier post, I’ve become a huge fan of a certain eye cream and I promised to tell you more about it. 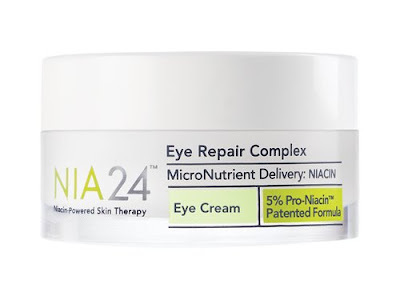 The object of my obsession is the new NIA 24 Eye Repair Complex. I’ve been using this eye cream morning and night for the past few weeks and I noticeably smoother and firmer under-eye skin. NIA 24 is working. The key ingredient in this skincare line is a cutting-edge, patented Niacin molecule called Pro-Niacin. Here’s how I understand it; when the skin’s Niacin content is increased, the skin barrier is strengthened, moisture retention is improved and cell turnover is increased. The result: fresher looking skin. NIA 24 products can be purchased at Space NK stores as well as leading dermatologists’ and plastic surgeons’ offices nationwide. I was in Bloomingdales in Soho over the weekend and saw it in the Space NK shop inside the store. Check out the NIA 24 website.